J Gulia, S Yadav, A Khaowas. Mastoid Cavity Myiasis In A Child: A Case Report. The Internet Journal of Tropical Medicine. 2009 Volume 6 Number 2. Myiasis (from the Greek myia, “fly”), is the invasion of wounds and body tissues of humans and animals by the larvae of the Diptera or two-winged flies, which, at least for a certain period, feed on the host’s dead or living tissue1. The Calliphorinae contain the generae Lucilia, Calliphora, Cordylobia, and Auchmeromyia . Several species of Lucilia including L. cuprina and L. sericata are the sheep blowflies that are facultative ectoparasites. Their larvae infest and feed on the living tissues of warm-blooded vertebrates, particularly the domestic sheep2. Cases of human ear myiasis recorded in the literature are not numerous and there are only sporadic reports from various countries of the world3,4. A case of aural myiasis in a child operated for unsafe chronic suppurative otitis media is being reported. A 10 year old male child presented in the outpatient department of Pt. BDS PGIMS Rohtak with a history of pain and purulent, blood stained and foul smelling discharge from the left ear for one week duration. It was associated with intermittent headache, hearing impairment and tinnitus. There was no history of dizziness, vomiting, visual trouble or neurological deficit. Past history revealed that the child was a diagnosed case of chronic suppurative otitis media and has undergone modified radical mastoidectomy two months back. Family history revealed that the child belonged to rural background and he had three brothers and one sister. On examination, the patient was afebrile pulse was106 per minute and B.P was 110/70 mm of Hg. Otorhinolaryngological examination revealed blood stained discharge in the left external auditory canal (EAC), it was cleaned and live maggots were noticed (Fig1). The EAC and mastoid cavity were cleaned using forceps and suction. Five live maggots and a dead green colored fly were removed (Fig2). 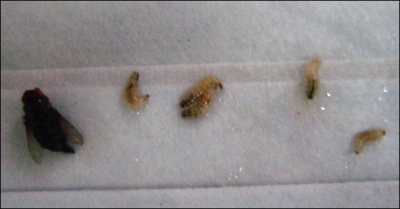 Figure 2: showing five maggots removed along with a dead fly. Patient was put on amoxicillin 250 mg t.d.s along with topical antibiotic drops for ten days. On follow-up no maggots were visualized and patient relatives were advised to maintain hygiene. Myiasis is the invasion of live mammalian tissue by the larvae of diptera flies for feeding on the host organs and body fluids. The fly may also drop its eggs while in flight on the skin, wounds or natural openings. Larvae hatched from the eggs can affect cutaneous tissue, body cavities and body organs5. The extent of the disease depends on the fly species responsible for the disease and the host immune response6. Myiasis is a common parasitic infestation in the tropics and subtropics but rare outside the endemic regions. The classification of myiasis is based on larvae location on the host body or according to the type of host– parasite relationship (obligatory, facultative or pseudomyiases)2. The genus of Lucilia blowfly is obligatory and/or facultative ecto-parasites that belong to Calliphoridae family and are found in meat and animal corpses. They cause myiasis in humans and domestic herbivorous animals. The Calliphoridae family is divided into two subfamilies as Calliphorinae and Chrysomya. The Calliphorinae contain Lucilia, Calliphora, Cordylobia and Auchmeromyia genuses. The adult Lucilia fly has a metallic-green or copper green color with a diameter of 8-10 mm and is seen around butcher shops and slaughter houses. Dermis and wounds are the most common sites of parasitism. Although they are usually known as sheep blowfly, they do not have host specificity. They are found worldwide. Their life cycle is 2 to 3 weeks, but it may be shorter in summer. The eggs transform into a conical larva between 8-12 hours and complete peritreme of posterior respiratory spiracles. Larvae then develop after 4-8 days and transform into the adult fly after 6-14 days7,8. Although any exposed human surface may be involved in myiasis, intact or damaged skin, eyes, nose, ears, brain, scalp, and uro-genital tract can also be involved9. Hypoesthesia or decreased consciousness, paralysis and immobility are the contributing factors that prevent the patient from fending off the fly. It has almost always been found in debilitated and emaciated patients. Local factors such as inflammatory and malignant disease and general factors including psychiatric illness, senile debility, and mental sub-normality and alcoholism play an important predisposing role10. Most patients belong to the poor stratum of society, dwelling in overcrowded premises that are often unsuitable for habitation and in a fly-infested environment. Rural agricultural areas and poor personal hygiene are the other predisposing factors for myiasis. Myiasis in hospitalized patients occurs with some frequency. Bedridden patients with open wounds may become infested if flies are about. 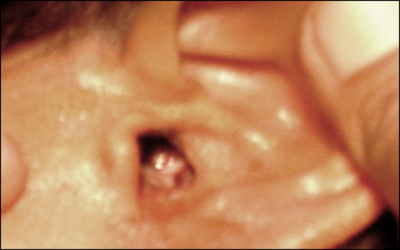 Aural myiasis can occur in the bedridden patients with healthy ear. Care should be taken to prevent maggot infestation in these patients especially in mentally challenged and psychiatric patients. In addition to general improvement of sanitation and personal hygiene, it is important to keep the rooms of patients free of flies5,7. The clinical aspects of myiasis vary with the regions affected, with the species of fly involved, and with the numbers of maggots present. Clinical presentation of aural myiasis includes aural discharge, which is foul–smelling, purulent, and blood-tinged, severe pain, and irritation in the affected ear, and occasionally, tinnitus and vertigo. Aural myiasis is dangerous, since the larvae located in the middle ear may find their way into the brain5,7,8,10. Physical examination usually reveals crawling maggots, granulations, and debris in the affected ear canal. Nasopharyngeal myiasis including aural and ocular myiasis involves invasion of the head cavities of the outer ear, nose, mouth and accessory sinuses. Infestations of the nose and ears are extremely dangerous because the larva may penetrate into the brain, and in these cases the fatality rate is reported as 8%. Myiasis may also be accompanied by inflammatory reactions and secondary bacterial infections, massive destruction and life-threatening consequences2,5,8. Ocular involvement accounts for 5% of all myiasis cases11. The treatment of myiasis includes mechanical removing maggots and cleaning lesions with topical medications and local antiseptics. Systemic antibiotics for combating secondary infections have been recommended as treatment options. 1. Braverman I, Dano I, Saah D, Gapany B. Aural myiasis caused by flesh fly larva, Sacrophaga hemorrhoidalis. J Otolaryngol 1994; 23: 204- 5. 2. Hall M, Wall R. Myiasis of humans and domestic animals. Adv Parasitol 1995; 35: 257-334. 3. Kumararasinghe SP, Karunaweera ND, Ihalamulla RL. A study of cutaneous myiasis in Sri Lanka. Int J Dermatol 2000: 39: 689-94. 4. Panu F, Carabas G, Contini C, Onnis D. Human auricular myiasis caused by Wohlfartia magnifica [Schiner] ( Diptera Sarcophagidae) : first case found in Sardinia. 1983; 23: 47-48. 5. Noutsis C, Millikan LE. Myiasis. Dermatol Clin 1994; 12: 729-36. 6. Ottanto D. The immunology of myiasis: Parasite survival and host defense strategies. Trends Parasitol 2001; 17:176-182. 7. Stevens J, Wall R. Classification of the genus Lucillia (Diptera Calliphoridae) : a preliminary parasimony analysis. J Nat History 1996; 30: 1087-94. 8. Talari SA, Sadr F, Doroodgar A, Talari MR, Gharabagh AS. Wound myiasis caused by Lucillia sericata. Arch Iranian Med 2004; 7: 128-9. 9. Amitay M, Efrat M, McGarry JW, Shinwell ES. Nosocomial Myiasis in an extremely premature infant caused by sheep blowfly Lucillia sericata. Pediatr Infec Dis J 1998; 17: 1056-57. 10. Cetinkaya M, Ozkan H, Koksal N, Coskun SZ, Hacimustafaoghu M, Girisgin O. Neonatal myiasis: a case report. Turkish J Pediatr 2008; 50: 581-584. 11. Wilhelmus K. Myiasis palpebrarum. Am J opthalmol 1986; 101: 496-8.